When the designers Dunne & Raby are asked what is critical design, they conclude their answer by saying: its opposite is affirmative design: design that reinforces the status quo. I consider it a wonderful way of framing it, which not only applies to design, but to any kind of professional practice; in fact, one of the problems of the world is that most of the practices, disciplines and professions are affirmative, instead of critical. Design, as we know it, has always been serving the establishment and has helped to reinforce the status quo. Even the radical design from the 70’s, only generated statements against design from within design, but it did not assume a wider context to frame its ‘radical’ practice. Design has never been considered to be a critical practice… and it has not proven to be one either, just until a few years ago. Today, critical design poses questions about our way of life and the way our societies function. Maybe for this reasons, design students are seen as affirmative and conformist, instead of critical people. To confirm this is enough to look around the student protests around the world, where the social scientists and artists have the stronger presence, but designers are nowhere to be seen (at least not as a collective), with a few recent exceptions. With few resistance from the students, design programs around the world are constantly changing (sometimes for good, sometimes… not that good), and the institutions get used to a constant and fluid change, with few resistance from others involved. Recent events in the Design Academy Eindhoven may be more important than they are perceived and may point a new direction for designers, as critical practitioners. A couple of weeks ago, during the week where the 1st years finals exhibition, the 2nd years graduation presentations and exhibition, and the farewell of Gijs Bakker from the DAE Masters department, the three heads of the master departments resigned together, arguing differences with the Board of Directors, of how the master program should be led. After this decision, almost two weeks of confusion followed for all the parties involved. Here is when I have to explain why I wrote the first two paragraphs of this post: the Academy, underestimating the group of students (because, they are design students, surely they are not critical), tried to minimize and simplify the situation by saying that changes would be for the best and that they would solve the issue with the best possible option for your education. Since the beginning, everything was a flow of misinformation and confusion, with rumors as the only source of information and the lack of transparency being the constant in the communication of the school. At the end, the students gained more than what they had lost, for the heads returned and all the eyes will be on the program on the coming months; also, a strong precedent remained, that design students can be critical. The three heads announce to the board of directors their resignation letter. A few hours after, an official mail is sent fro the Academy to the new coming students to inform them the news. The news gets filtered to the actual students, who start asking between each other about the rumors. Some students meet with the three heads in the evening, at the end of Gijs Bakker’s farewell party, receiving a brief explanation of their reasons to leave. DEZEEN publishes a news story on the situation, with a short context and a description of the facts. Interesting to look at the discussion opened at the comments of the article. NRC, now of the most important newspapers in the Netherlands, publishes an interview they made to the heads, regarding their resignation (in Dutch). ED (Eindhoven Dagblad), publishes a short story on the situation and invites students to put their voice out (in Dutch). KNACK, a Belgian newspaper, publishes another news story (in Dutch). Due to the high level of indignation from the students, the board of directors offered to meet with them in the afternoon. The students have a meeting with the Student Council and after meet the board of directors. The students leave with almost no hope and full of shallow promises. DEZEEN publishes the resignation letters given from the three heads to the board of directors. ED urges students to raise their voices and send their opinions to the paper. DOMUS magazine, in its online version, publishes the resignation letter from the former heads and a comment from Hella Jongerius on the situation. DISEGNO Magazine publishes an interview to the leaving heads, where they explain their reasons for leaving and give some context to the situation. The heads end the interview by confirming their will to return. Some current and prospective master students, along with a group of bachelors, meet with Jan Boelen in representation of the leaving heads. He gives their vision on the situation and give some historical context on why that was happening, as well as states their will to restart dialogues with the academy as soon and open as possible. Onomatopee offers to host and moderate an open discussion as an impartial space. The board of directors reject the invitation. The directors promised to meet the new-coming students and answer their questions. Current master and bachelor students, along with meter alumni, join the meeting. A very tense meeting, with the students trying to push the restarting of the dialogue between the parts in conflict, but the lack of will of doing it from the side of the school. DESIGN.NLPublishes a very thorough and objective news story on the situation, getting insights from most of the parts (still no trace of the students -not even in others parts opinions!). Current master students have a meeting with the board of directors, to receive a promised update and communication of how was the situation being resolved. Who would be the Dean of Education (Irene Fortuyn) joins the meeting. No answers nor solutions were given, though the rumors of the restarting of the dialogues with the heads and a likely meeting on the 17th give a slight of hope. The students keep putting pressure on the school to take action. The heads meet with the supervisory board to express their version on what had happened. The feeling of the meeting was positive, though no cornet decisions were communicated yet. 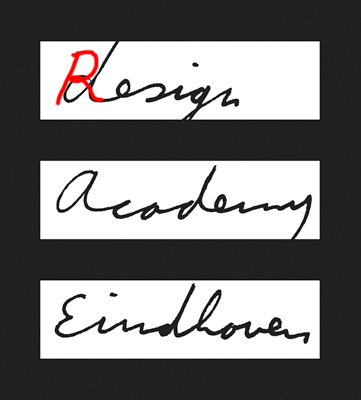 DESIGN.NL Publishes a story informing the return of the heads to the Academy, under the title Order & Sense Restored. The Academy posts an official communication on their website, announcing the agreement made with the heads. ITEMS Publishes a story with the information of the return of the heads under the title Educational Reform Postponed. It acknowledges the pressure made from the students to the school and heads to come to an agreement. I have written this post in 3rd person, though I lived it in 1st person. I am one of the current students, and do this as a kind of catharsis: in some moment, I thought on quitting, due to the uncertainty of what would the program be the coming year. There were many things going on behind closed doors which I, either don’t know about, or can’t tell about; but I was really glad to feel some critical mass going on (see Philip Ball) and, despite the coming holidays, the commitment of the group of students to take charge of the situation. Probably we did not use the soft power of design (see Rick Poynor), but we did use the power of the student or apprentice: critical conversation, dialogue and constant questioning.